How good was A.I. in his prime? Love him or hate him, Allen Iverson provided once-in-a-lifetime moments and that is a call for celebration. And once-in-a-lifetime athletes call for recognition. Reebok Classic congratulates Allen Iverson on a memorable career that has earned him respect and recognition among the greats. Allen Iverson’s legacy will now live on high above the court where he first made his NBA debut in 1996 wearing the iconic Question Mid. In honor of Allen Iverson’s jersey retirement, Reebok Classic memorializes a legendary athlete with an unforgettable iteration of the Question Mid. No detail was overlooked in creating a ceremonial version of this classic silhouette, from the custom sock liner to the jersey fabric upper. 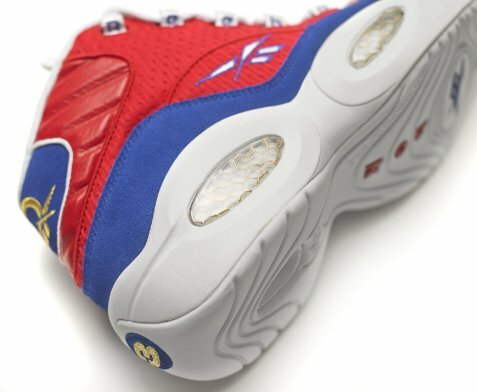 Only 1996 numbered pairs of the Banner Question will be released on March 14th at select retailers nationwide for $160. Official retailers will be announced during the Sixers retirement ceremony on March 1st, so stay tuned on where to grab a pair. Reebok Classic Alert: Kamikaze I are back with the same flare and comfort!